When you need a professional and affordable handyman service provider in New Jersey, your search ends with HAYS, New Jersey! Handyman at Your Service (HAYS) is your single-contact handyman company in New Jersey offering high quality services and innovative solutions to all household problems in and around the New Jersey area. Our skilled and qualified handyman technicians servicing most NJ cities and towns can tackle your problems and address your needs 24 hours a day and 7 days a week! Call us at 212-222-2770 and make a same day appointment or schedule at your convenience. Day or night. What Distinguishes HAYS from other handyman services in NJ? We know that since there are so many handyman service providers for you to choose from in New Jersey, selecting a reliable one is not an easy task. HAYS New Jersey has distinguished itself from other handyman companies in New Jersey by offering a complete range of services both indoor and outdoor, from plumbing, electrical, locksmith, to flooring, heating and cooling and custom woodworking. We are experienced in providing full range handyman services, including complete interior and exterior renovation of residential and commercial properties both. How to Contact and Hire HAYS NJ in New Jersey? Once you contact us and talk to one of our experts, our dedicated service center will send the right technicians to your place. 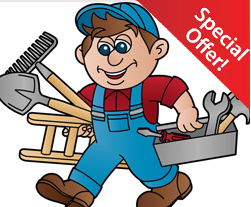 We only send over the most experienced and specialized handyman, and will never compromise on service quality. Our technicians will work to your specifications, within your set schedule and budget. All it takes is a phone call or an email from you for us to improve your home or office! You can call us at 212-222-2770 or write to us at haysnjhandy@gmail.com.